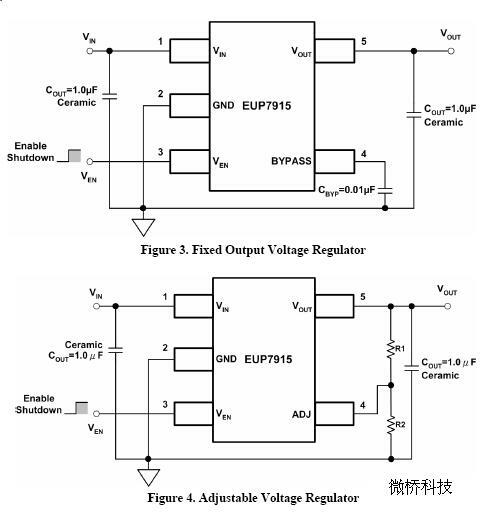 The EUP7915 is an efficient, CMOS voltage regulator optimized for ultra-low-noise applications. It offers high output accuracy, extremely low dropout voltage low ground current and fast start-up time. The EUP7915 provides a very low noise output, ideal for RF applications where a clean voltage source is required. A noise bypass pin is also available for further reduction of output noise. Designed specifically for handheld and battery- powered devices, the EUP7915 provides a TTL-logic-compatible enable pin. When disabled, power consumption drops nearly to zero. The EUP7915 also works with low-ESR ceramic capacitors, reducing the amount of board space necessary for power applications, critical in handheld wireless devices. Available in the SOT23-5 package, the EUP7915 offers a wide range of output voltages. Key features include current limit, thermal shutdown and faster transient response.